A healthy and delicious breakfast dish for kids, this Mushroom Dosa can also be served for dinner. 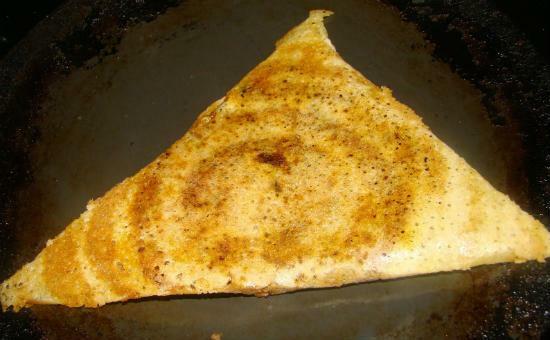 No need for any separate side dish as the masala in the dosa would be more than sufficient. 1. Grind all the ingredients given for grinding to a fine paste. 2. Wash and finely chopped the mushrooms. 4. Add the onions and tomatoes. 5. Saute until onions turn light golden. 6. Add the ground paste, salt and turmeric powder. 7. Add the mushrooms and stir well. 8. Cook until the raw smell is gone. 9. When the moisture has almost evaporated, garnish with curry leaves and remove from flame. 10. Add sugar to the dosa batter and mix well. 11. Heat a dosa tawa over medium flame. 12. Pour a ladleful of the batter and apply oil around the edges. 13. When it is three-fourths cooked, add some of the mushroom mixture and spread evenly. 14. Fold into half and cook for another 30 to 45 seconds on both sides, carefully flipping it over. 15. Remove and serve at once. Feel free to comment or share your thoughts on this Mushroom Dosa Recipe from Awesome Cuisine.